You CAN build a business doing what you love. Lots of variations of this exist of course, but generally what I hear SO OFTEN is that there is a lot of self-doubt out there. I get that. And I’m not here today to tell you that it’s wrong or that you shouldn’t feel this way. I am not here to tell you that successful people don’t have self-doubt or any other BS like that. Everyone experiences self-doubt and I think especially when it comes to the things we care the most about doing well. 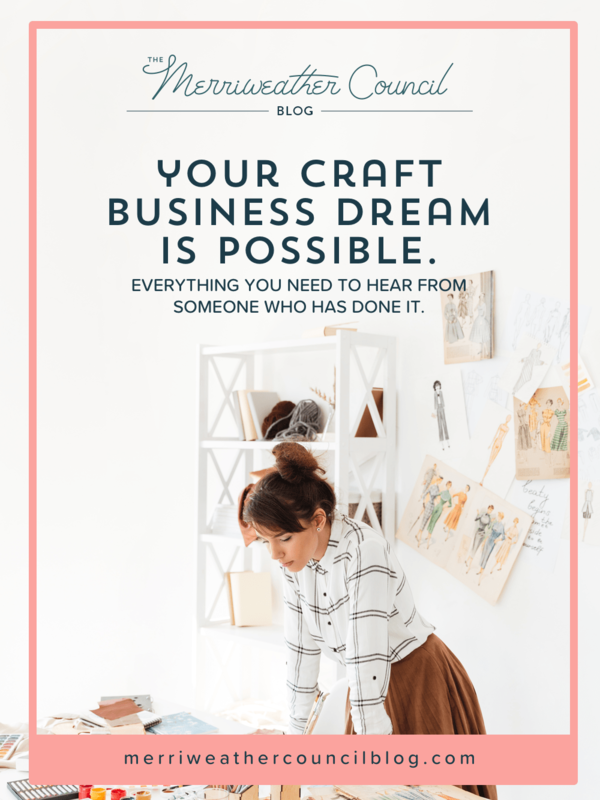 What I do want to tell you is this: it IS possible to build a business around your crafty tendencies. It IS possible to build a business doing what you love. All the things you think are standing in your way, they don’t have to be. You just have to decide to make it happen. Make it work, with what you’ve got. It might start small, it probably will. It might start messy, it’s okay. It might grow slowly, that’s alright! If you are reading this post you are invested, I can tell, in growing your business in a professional and meaningful way and that is major. So congratulations to you on that. You’re awesome. Even if you have doubt, even if you aren’t fully in business right now. You’re here on my blog, not by happenstance, but because you were looking for something. Is this it? If you’re here that means that you are on a journey, for lack of a better word, towards being an entrepreneur or you already are an entrepreneur and you are still on your journey. You are not someone who just sits around and daydreams about making money from the things they love, you’re someone who is out there making moves, reading this blog, educating yourself. You are trying to turn this into a reality for yourself and I thank you so much for allowing me to be a small part of that journey with you because I know this is not just a hobby for you. I know that this business that you’re building means a lot to you and that your business is like another baby – your Biz Baby. So, I do not take it lightly that you have allowed me to come alongside you on this journey and be a small part of something that is so important to you. Even just allowing me to speak some encouraging facts to you in this post, it really means a lot to me. You might be wondering how do I know it’s possible for you? Well, I have done it myself and I have been able to work with hundreds of crafty people just like you and help them turn their talents into profits, too. I am hoping that you and I will be able to work together to make that happen for you as well. From my firsthand experience, I can tell you it is possible to do this crafty entrepreneurship thing. Frankly, it has never been easier to step into the arena, and people around the world are seeking out more creative, artistic and handmade products and experiences now more than ever. I have seen and felt in my own personal experience just how satisfying it is to build your own business and to have a career being creative and doing what you love. Being able to share the things that you love and that you’ve made and your passion for what you do with other people… that is truly rewarding and that’s not just like woo-woo BS, that’s real. That really does feel awesome. And that feeling is a large part of why I do what I do. I know how good it feels to make this a reality, and I want to help you do it, too. It is really fun to be your own boss. I don’t think that’s any secret. It is amazing and it feels really good to sell the stuff that you’ve made, but sometimes it’s hard. You need to know where to show up and when, with what, in order to attract the right audience and yes, regardless of what your friends tell you, regardless of what your mom, your dad, your coworkers, your brother, your sister, your neighbor… regardless of what any of those people say, you can build a business doing what you love. I’m living proof of it because I’ve done it twice already and I have students who are out there doing it every single day as well. It’s not magic. You just need to have a little bit of guidance to get you moving in the right direction and that’s what I can help you with. You might be worried about the time commitment, or think you’re too busy to start right now. But riddle me this, maker friend: the time will pass anyway. And you know as well as I do that there will ALWAYS be something else going on. There will always be a reason to say NO. But there are so many reasons to say YES to yourself and your ideas. You already know what those are. My mission at Merriweather Council has always been to create and provide and publish the types of content or resources that I wish existed when I first started my business. When I first started, my business had very limited everything. Limited time. Limited space. Limited money. Limited everything and I’m sure that’s the case for you as well. Whether you’re just starting out or you’re a little bit further up the road, we all have our limits even when we are making money. We don’t want to be spending all of it. We all have our limits, we just need to know how to work with them. It’s work. No doubt about it. It is, and it will challenge you and you will continue to feel doubt. But you’ll be feeling doubt WHILE building something you’re so proud of, not while sitting on the sidelines watching other people do it. 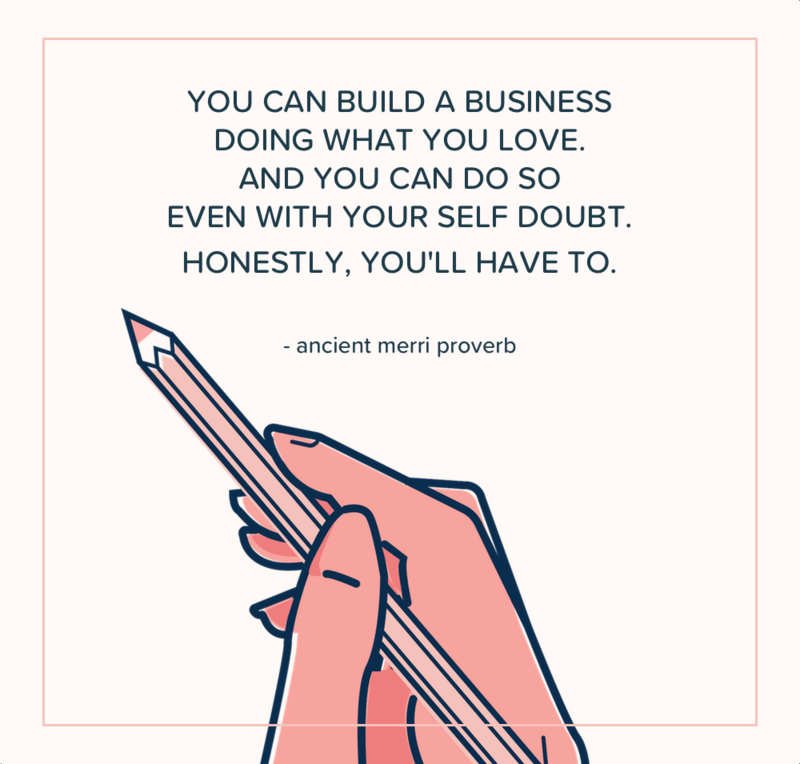 You can build a business doing what you love. And you CAN do so even with self-doubt. Honestly, you’ll have to. Bring your doubts, your hopes, you curiosities and your passion to The Council, I can’t think of a reason why you’d want to jump into the business of your dreams without a dedicated community and some of the most solid resources and inspirations around. No one’s dream business deserves outdated, stale, commonplace or chintzy anything. That’s why I built The Council, and if you’re interested, I’d love to tell you more. Progress Report: Kits, Patterns, Power Hours, Oh My!